"Standing rib roast recipe with brine. Great for a holiday dinner!" Stir warm water, coffee, kosher salt, onion soup mix, onion, garlic, and Worcestershire sauce in a 16-quart stock pot until salt and onion soup mix has dissolved. Lay roast in the brine and cover pot; refrigerate at least 8 hours. Turn roast over at least twice during brining. Remove roast from brine and pat dry with paper towels. Place roast on a rack in a roasting pan with the fat side down; sprinkle with garlic powder, onion powder, and black pepper. Flip roast and season other side the same way. Let roast stand until it reaches room temperature, about 1 hour. Place roast into preheated oven and bake for 1 hour. Turn off heat and leave meat in the hot oven, without opening oven door, for 3 hours. Turn oven back on and set heat for 375 degrees F (190 degrees C). 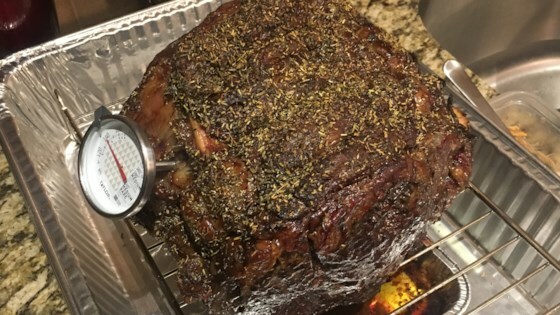 Let roast reheat until an instant-read meat thermometer inserted into the center of the roast reads 130 degrees F (54 degrees C) for medium-rare, 30 to 40 minutes. Fantastic recipe - whenever I tell people I brine a rib roast they think I'm crazy. Until they try this. I usually just leave off the French Onion soup and sub Beef Broth. This recipe was flavorful, super tender and juicy, most awesome, even though i did not have the french onion soup pkg. We loved it.